The season of comfort food is upon us! In my opinion there is no more glorious a time for eating than when the weather turns cold and the leaves fall from the trees. Some people have their summer barbecues, strawberry shortcakes, and corn on the cob, but for me nothing is better than a hot, steaming plate of comfort. It can come in many forms - a hearty meat chili, gooey baked mac ‘n cheese, a rich, creamy bread pudding, but perhaps my favorite is Chicken Stew with Biscuits. Its sort of like chicken pot pie, but with biscuits, and lets face it, everything tastes better with biscuits (and bacon, but that’s a post for another day). 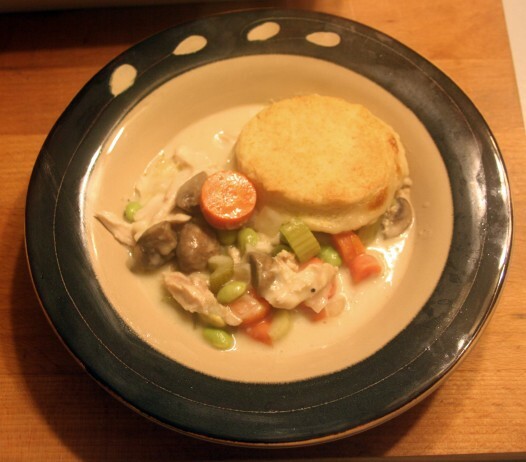 This is essentially the combination of two recipes; one for chicken stew (which I’ve adapted from Ina Garten’s book Barefoot Contessa Family Style) and my go-to, easy-peasy biscuit recipe. You can certainly roast your own chicken, but for ease of assembly (and one less than to make) I usually opt for the store-bought rotisserie chickens that seem to be ubiquitous these days. Bonus - save the chicken carcass to make your own homemade chicken stock, which can be frozen for up to two months and used the next time you make Chicken Stew with Biscuits. I promise you that this is a recipe you will be coming back to over and over again. 1. Preheat the oven to 350F. Remove as much meat as possible from the rotisserie chicken and shred with your fingers. Save the skin and bones to make homemade stock later. 2. Add the shredded chicken, diced carrots & celery, and peas to a 9x13 oven-proof casserole dish. Add a dash of salt and a dash of pepper and mix to ensure all bits are evenly distributed. Set aside. 3. In a large skillet heat the 3 tbsp butter and 2 tbsp olive oil over medium heat. Add the onion and garlic and saute until softened, about 5 minutes. Add the 1/4 cup flour and stir into the onion mixture. Let cook for about 1 minute, stirring constantly (this will get rid of the raw flour taste). 4. Pour the chicken stock and 1/2 cup cream into the skillet and whisk to remove any lumps. Raise the heat to medium-high and bring to a boil, whisking constantly to prevent scorching. Let boil for 1 minute and remove from the heat. Add salt & pepper to taste. 5. Pour the liquid over the chicken and vegetables in the casserole dish. Cover with aluminum foil and bake for 45 minutes. 1. 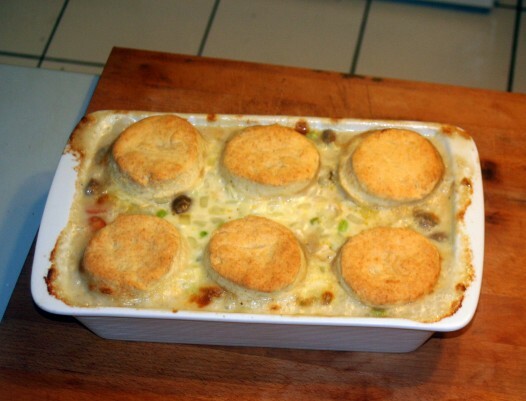 While the casserole bakes you can make the biscuits. In the bowl of a food processor fitted with the chopping blade combine the flour, baking soda, and salt with a few pulses. Add the cold butter and pulse until it is cut into the dough, about the size of small peas. With the motor running slowly pour 1.5 - 2 cups of cream or half & half until the dough just comes together in a ball. (You can also mix the dough in a large bowl; just cut in the butter using a pastry blender or two knives and proceed with the rest of the recipe). 2. Dump the dough out onto a lightly floured board and gently pat into a circle about 3/4 inch thick. 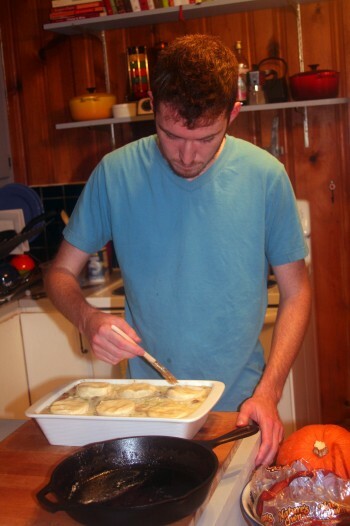 Using a 3" biscuit cutter (or small juice glass) cut out six round biscuits, reforming the dough scraps as needed. Any scraps left can be refrigerated for a few days and used for extra biscuits or shortcakes. 1. After 45 minutes remove the stew from the oven and raise the oven temperature to 425F. 2. Remove the aluminum foil and gently arrange the biscuits atop the stew. Brush each biscuit with some melted butter. 3. 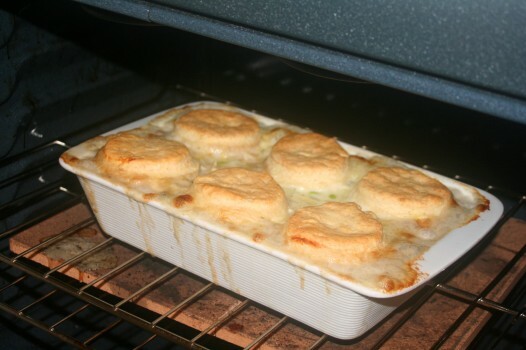 Once oven has reached 425F place stew back into the oven and bake, uncovered, for 10-12 minutes or until the biscuits are golden-brown on top.